While the easiest method for cleaning print heads is to use the built in clean/purge function in the software, sometimes print heads are too clogged for this method to work. This is often the case if the print head has been left outside the printer for several weeks. The method described below has even been shown to recover dried up print heads that have been unused for years. Purchase a medium sized Ultrasonic Jewelry Cleaner. Vevor Model 10a with a tank size of 150mm L x 135mm W x 100mm H will work with LX900/Bravo 4100 series Print heads. It is best if the entire print head can fit inside the tank. This model is approximately $75.00. Fill the tank with enough water to completely cover the nozzles (about 0.5”) while the print head is sitting at an angle. 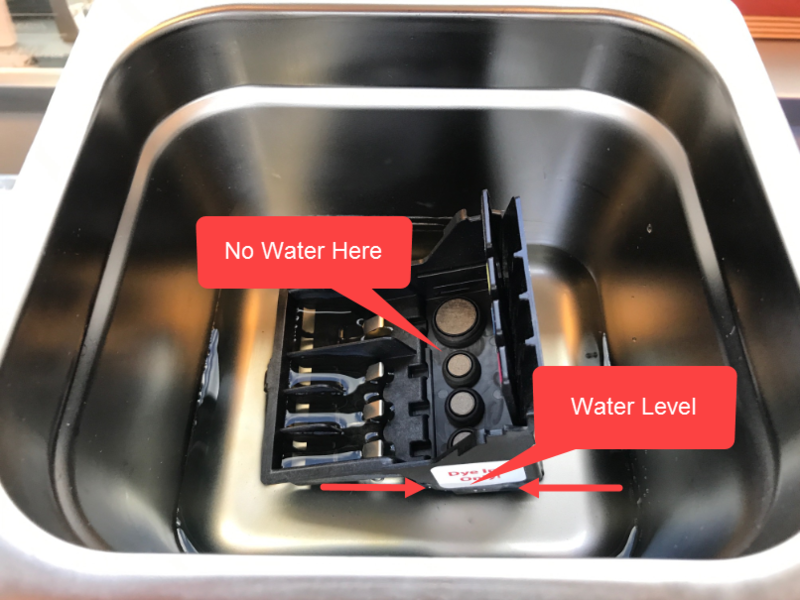 Do not fill the tank so high that water gets into the cartridge gaskets area as they could be contaminated with the water/ink mixture. Set the heat to 50C and run for 5 -15 minutes. Follow any additional instructions provided by the manufacturer of the Ultrasonic Cleaner. The water will be stained black when finished if the cleansing was successful. Allow the print head to completely dry. Place the print head back in the printer and try printing. If it does not work, it is possible that the print head needs additional cleaning time or the electronic components are simply worn out from use. If you would like Primera to perform this procedure for you please contact technical support to arrange this service. Your only cost will be the shipping charges to send us the print heads.